There are many once in a lifetime events that are of our own doing - first steps, first child, first house. Then there are the once in a lifetime events that are of a historical nature, be they good or bad, that we get to experience just because of the time period we happen to live in - first moon walk, 9/11, first African American president. Blogs are personal diaries of sorts and so I wanted to use this post to mark two such events that happened in the same week. The first is signified by the photo above - the Venus eclipse of the sun that occurred yesterday, June 5, 2012, between about 3 and 7 p.m. PDT. I was traveling back from Los Angeles and really thought I wouldn't get to see it for myself. Besides, I didn't have the proper safety glasses to be gazing at the sun. I was waiting at my gate at LAX to see a gentleman setting up a telescope by the windows. He was sweating quite a bit since the sun was streaming in from that side. He then excitedly told everyone he had the eclipse in view if anyone wanted to see it. Talk about luck. The Venus eclipse, he said, happens in pairs and then doesn't happen again for another 113 years. The first part of the pair happened eight years ago. A few weeks ago we had a partial solar eclipse which I just glimpsed on TV. I have seen a total eclipse before, so a partial wasn't as thrilling or important. A full eclipse is due again in 2017 anyway. 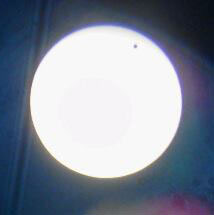 But a Venus eclipse happens only once in (over) a century and so I'm glad I lucked out and got to catch a glimpse. The second such event this week was Queen Elizabeth's Diamond Jubilee - 60 years on the throne. She is fast approaching the record of Queen Victoria's 64 years. I'm hoping that if she goes 65 years she will abdicate so Charles gets a short chance on the throne before he dies. After all, the poor guy is already 64 years old (he looks 74). Meanwhile, Prince William is already 30. Elizabeth took the throne at 25 and Victoria at the age of 18. I think it highly unlikely that there will be another Diamond Jubilee in the future. The lifespans of people are a lot greater now than in the past. I could only see a disaster/tragedy that could possibly place a young child/teen/adult on the British throne early enough to go for a 60 year reign. My dad is British and my grandmother lived to be 98.5. She was actually hoping to make it to 100. Apparently if you reach 100 you get a birthday card from the queen. I had the opportunity to see the queen myself in the 70s when she came to visit Saudi Arabia. The company contacted all British and Commonwealth families and invited the children to line the route as she visited the University of Petroleum and Minerals on the other side of the fence from our compound. I was searching for those pictures this week and can't seem to find them. I'm hoping it is because they were slides and they are buried in my trunks somewhere. While I'm at it, here are some other events I remember. I was only 4 or 5, but I have memory glimpses of both the first moon walk and the first episode of Sesame Street. I am a Trekkie and so I remember watching the Space Shuttle Enterprise's first test flight off the back of the 747. I was in Colorado visiting one of my best childhood friends at the time. I remember the death of John Lennon because he was shot on my birthday, December 8th. I didn't find out til the next day, of course, since he was shot around 11 p.m. I was at Ronald Reagan's first inauguration. It was cold since it was January. We had spots on the mall for his swearing in and then bleacher seats along the route for the parade. I was sitting on our waterbed watching the evening news when the 1989 SF earthquake occurred. Even though we are about 80 miles away, it was so big that the waterbed and chandeliers swayed. I saw the TV studio lights flicker as well. Everyone remembers where they were for 9/11. I had just woken up and turned on the TV to see the first tower in smoke before the second plane hit. Once in a lifetime events can be fun and tragic. This week, luckily, they were fun events.